Bharathiar University Result 2019 has been released. Bharathiar University Result can be checked after proving the registration number. Students can check Bharathiar University Result for annual / semester exam in their respective department also. The minimum passing marks for UG / Diploma is 35 % marks in each paper and 50 % marks in each paper for PG / PG Diploma. After the declaration of the students can apply for re-totalling/ revaluation. Students have to submit the application form for re-totalling/ revaluation. The final year students who have completed the course and passed in all the paper can collect all the necessary document from the university. Read the article for more information regarding Bharathiar University Result 2019. Latest: Bharathiar University has released CPP January 2019 Examinations Result (B.Sc – Optometry, PG Diploma & Diploma Courses). The students can appear for improvement exam within one year after the completion of the course. The improvement exam can be written only once. Check the table for Bharathiar University Result. Result: Students can check Bharathiar University result from, www.b-u.ac.in. How to check Bharathiar University Result 2019? Click the link provided above to check the result. Students can follow the steps to check Bharathiar University Result 2018. Click on the result or check the “News ” result announcement. The students can apply for re-totalling/ revaluation for all courses. The students should apply for revaluation /re-totalling within the 7 days from the day of result released. The application form can be downloaded from the official website. Students have to fill the application form and submit it along with the re-totalling/ revaluation fees to the controller of examination. The fee is to be paid in the form of Demand draft in favour of The Registrar, Bharathiar University, payable at Coimbatore. 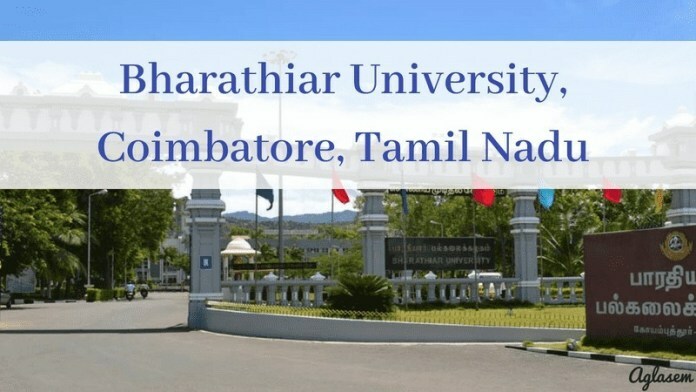 Bharathiar University is located in Coimbatore, Tamil Nadu. The University was established in February 1982. Bharathiar University was recognised by the University Grant Commission (UGC) in May 1985. The University got its name after the name of great poet Subramania Bharathi. There are 14 Schools with different departments in Bharathiar University. The University offers various programmes like UG, PG, PG Diploma, Diploma, Certificate, M.Phil and PhD. Bharathiar University conducts university exam twice a year in May / June and December / January at the specified examination centre. Check course wise fees structure.